The first two are balanced. 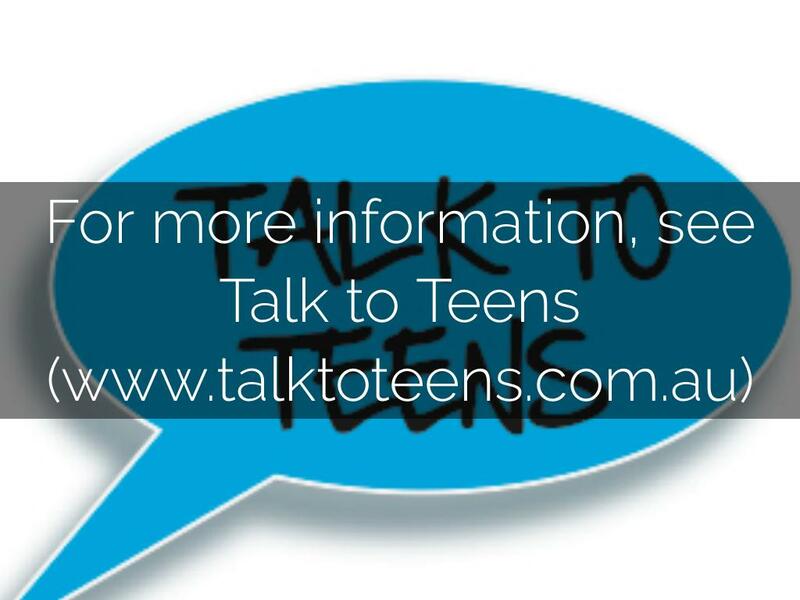 See Toula at www.talktoteens.com.au for more information. 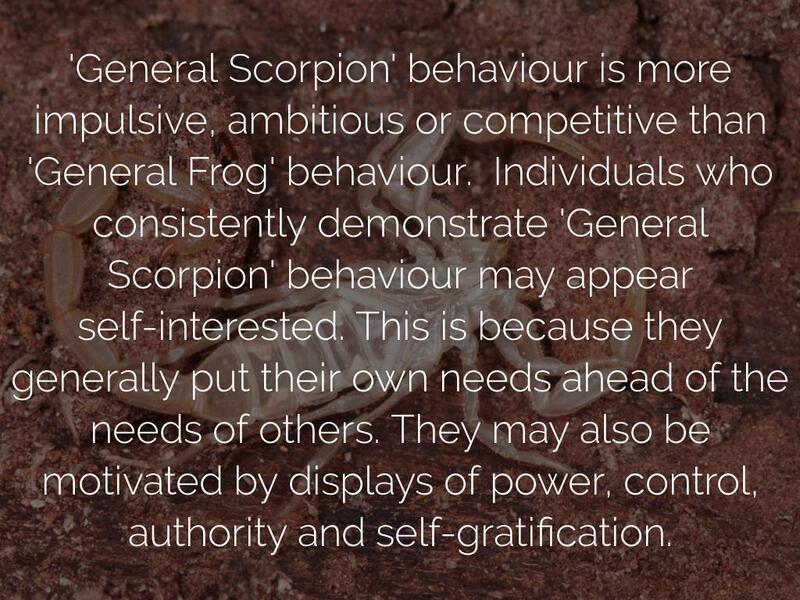 'General Scorpion' behaviour is more impulsive, ambitious or competitive than 'General Frog' behaviour. Individuals who consistently demonstrate 'General Scorpion' behaviour may appear self-interested. This is because they generally put their own needs ahead of the needs of others. They may also be motivated by displays of power, control, authority and self-gratification. 'Fearful Frog' behaviour can be based on an extreme level of overcaring. 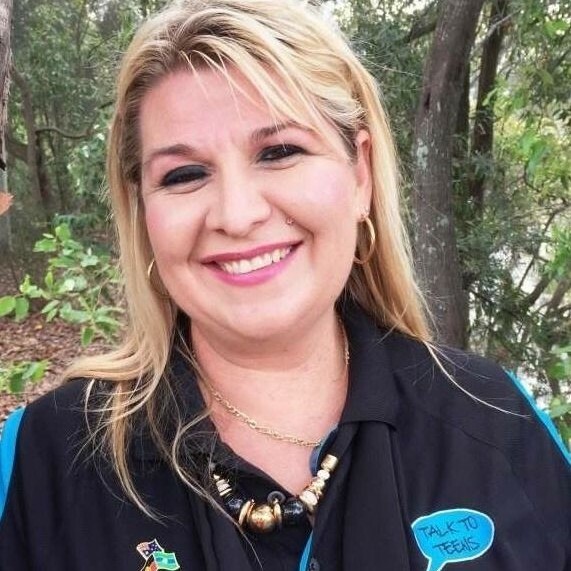 This level of caring is out of balance and often rooted in fear or negativity. The person might be afraid of what has happened in the past, what will happen in the future, fearful of disappointing others, or not achieving their goals. 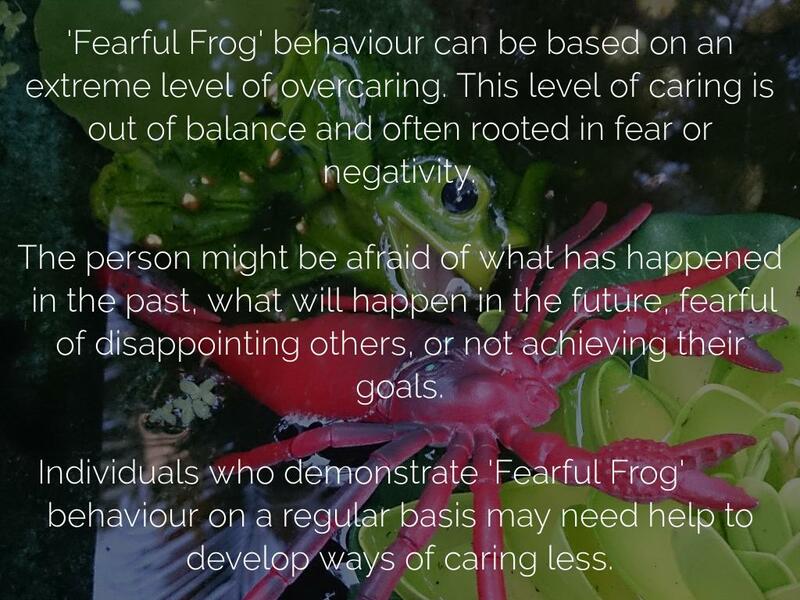 Individuals who demonstrate 'Fearful Frog' behaviour on a regular basis may need help to develop ways of caring less. 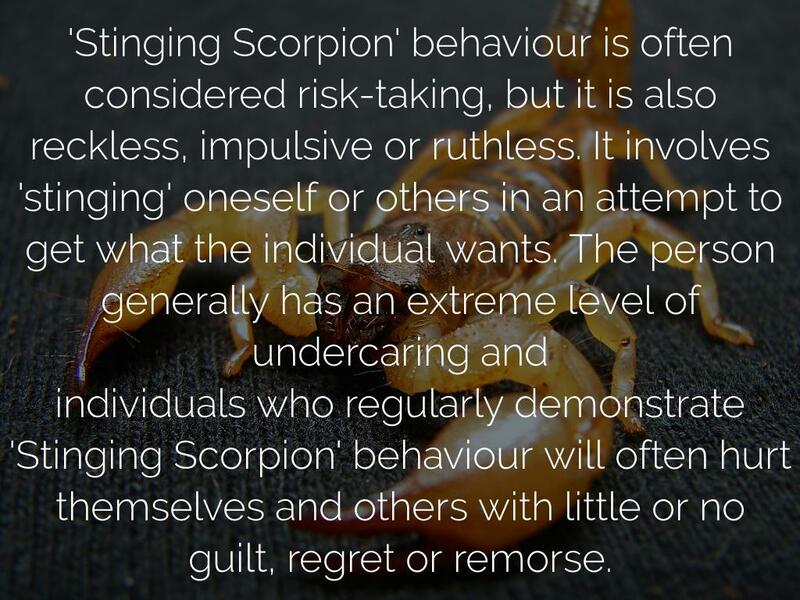 individuals who regularly demonstrate 'Stinging Scorpion' behaviour will often hurt themselves and others with little or no guilt, regret or remorse. 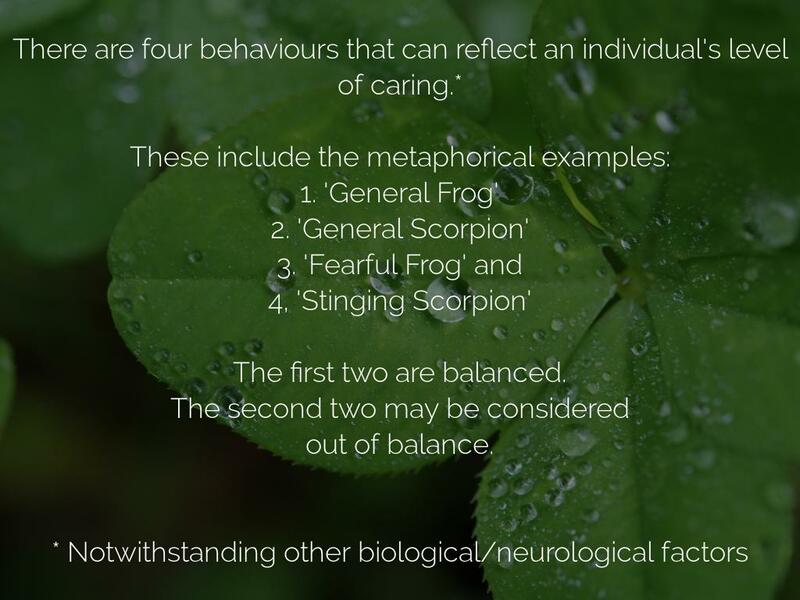 Everyone can act like 'frogs' and 'scorpions' at different times - depending on the situation and how much they care about it. People can also demonstrate both extremes of each. 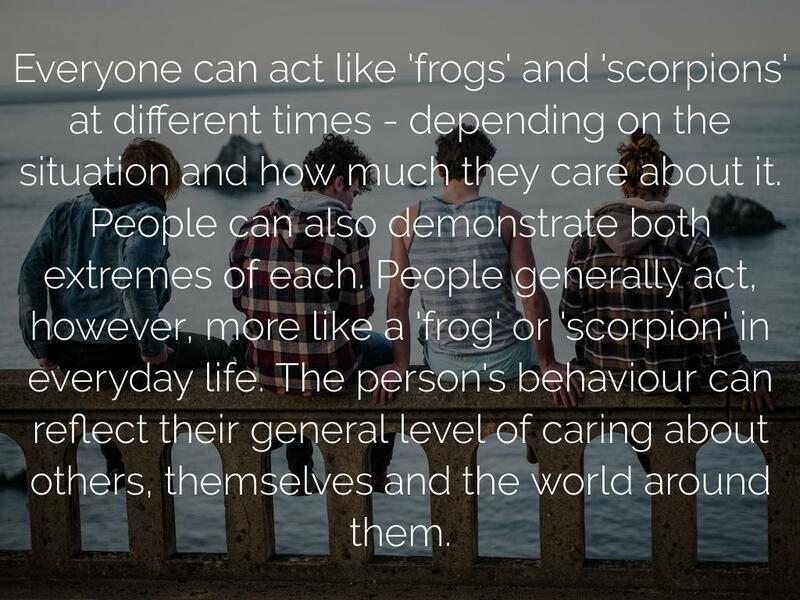 People generally act, however, more like a 'frog' or 'scorpion' in everyday life. The person's behaviour can reflect their general level of caring about others, themselves and the world around them. 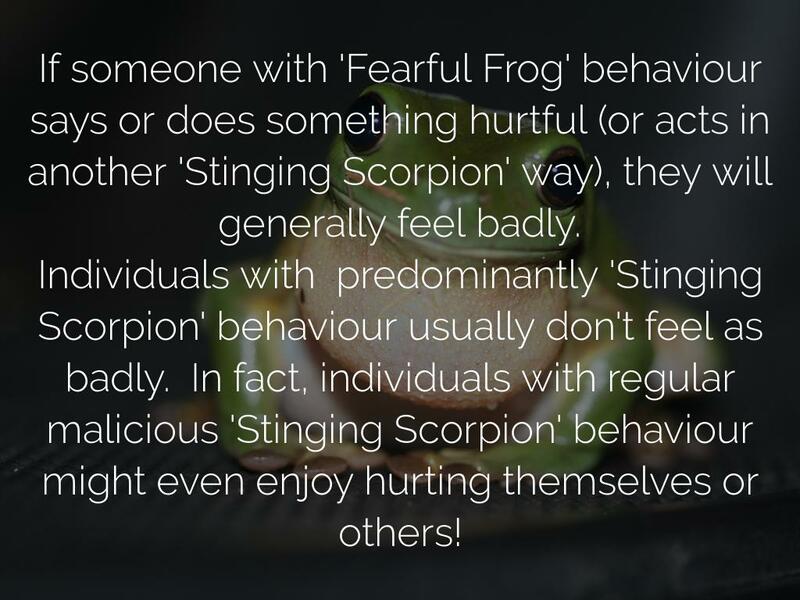 If someone with 'Fearful Frog' behaviour says or does something hurtful (or acts in another 'Stinging Scorpion' way), they will generally feel badly. 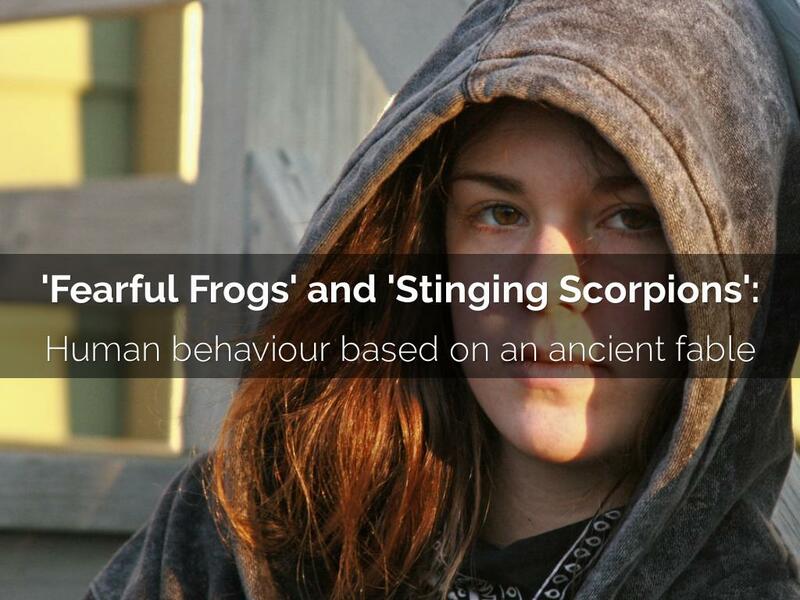 Individuals with predominantly 'Stinging Scorpion' behaviour usually don't feel as badly. In fact, individuals with regular malicious 'Stinging Scorpion' behaviour might even enjoy hurting themselves or others! 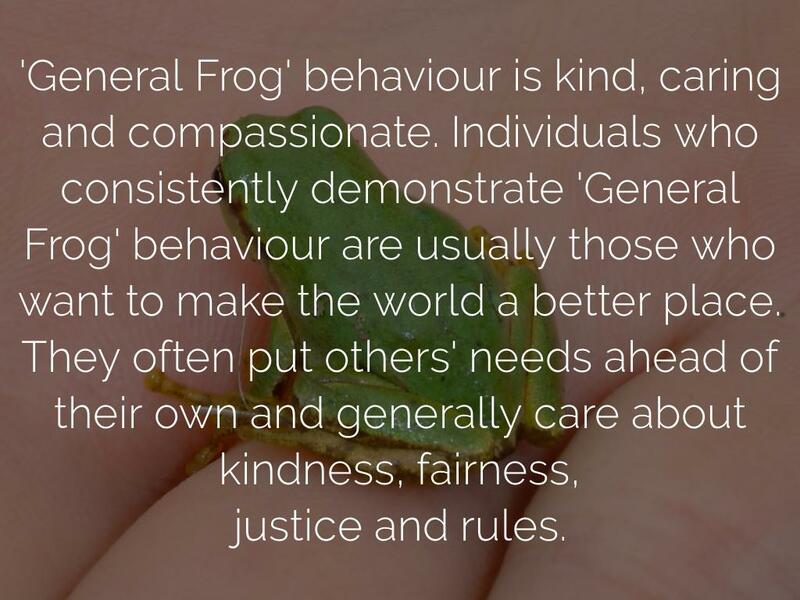 Individuals with high levels of 'Fearful Frog' behaviour often experience mental or behavioural health problems. These include anxiety, depression, stress, burn-out or self-esteem problems. They are sometimes a victim of bullying, and may have high levels of perfectionism, be highly analytical, or care too much about how things 'should' be! 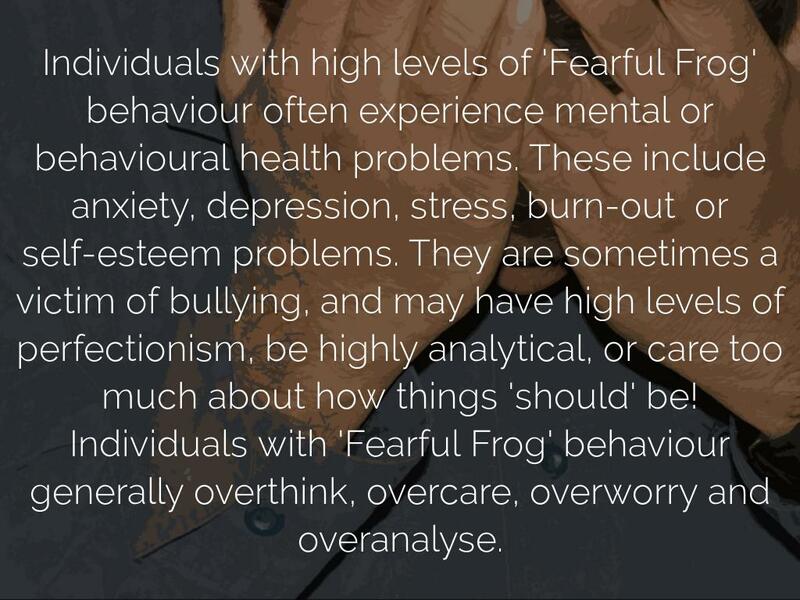 Individuals with 'Fearful Frog' behaviour generally overthink, overcare, overworry and overanalyse. 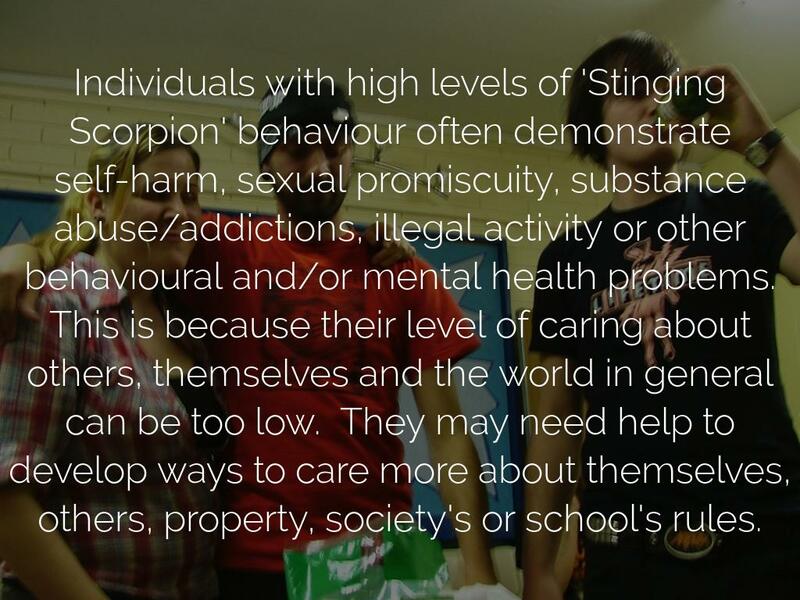 Individuals with high levels of 'Stinging Scorpion' behaviour often demonstrate self-harm, sexual promiscuity, substance abuse/addictions, illegal activity or other behavioural and/or mental health problems. This is because their level of caring about others, themselves and the world in general can be too low. They may need help to develop ways to care more about themselves, others, property, society's or school's rules. 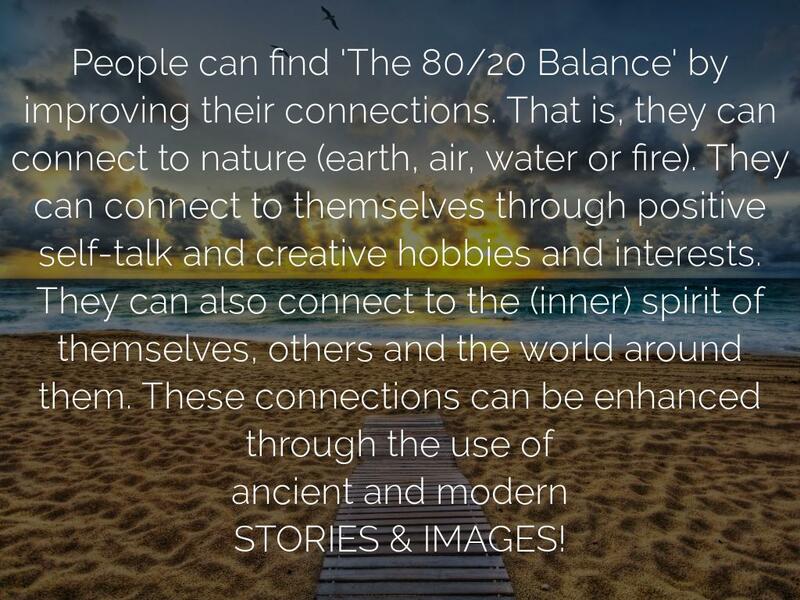 People with extreme levels of over- and undercaring may need to find the 80/20 Balance. 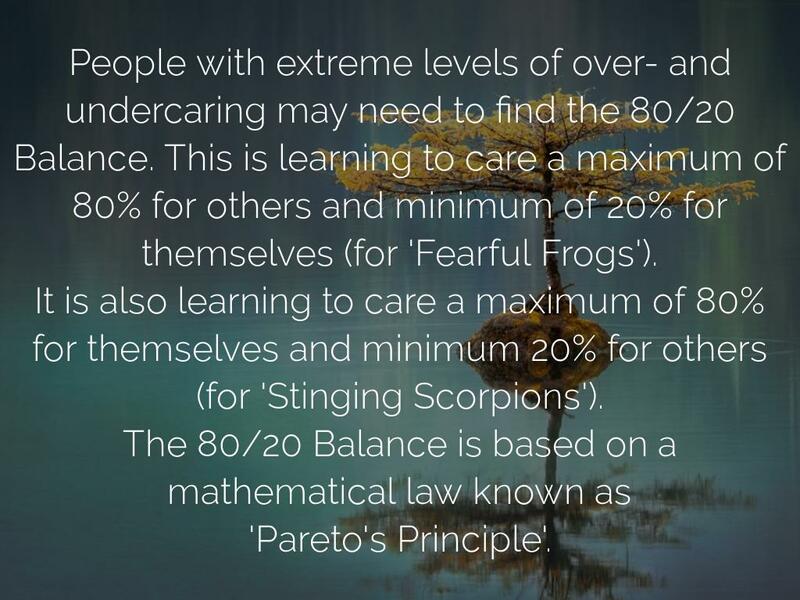 This is learning to care a maximum of 80% for others and minimum of 20% for themselves (for 'Fearful Frogs'). It is also learning to care a maximum of 80% for themselves and minimum 20% for others (for 'Stinging Scorpions').